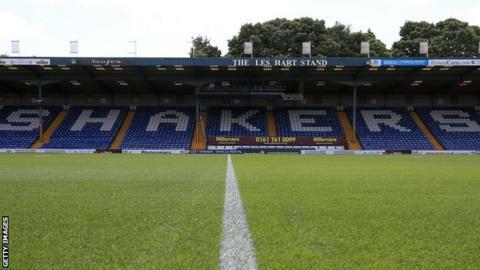 League Two Bury say they are working to resolve "unforeseen circumstances" that led to players and staff not receiving their March salaries on time. Wages were due to go through on Friday but have still not been paid. "We value our players and staff, and they were all informed last week," said a statement from the Shakers. Meanwhile, the club have been handed a winding-up petition by former head coach Chris Brass in a notice posted on the London Gazette on Tuesday. Former Bury defender Brass was moved from the club's head of football operations to become their head coach in December 2016, replacing David Flitcroft, before Lee Clark's appointment in February 2017. Chairman Steve Dale bought the Shakers in December. "The chairman and the board of directors remain fully committed to resolving the situation as quickly as possible, to ensure that the club can move forward and maintain our push for promotion," the statement added. Bury are third in League Two with seven games of the season remaining.